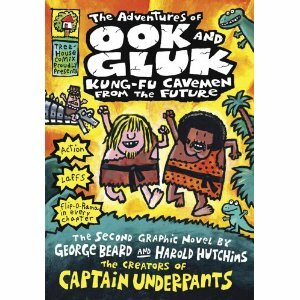 If you teach second through fourth grade, add The Adventures of Ook and Gluk: Kung Fu Cavemen From the Future (what a crazy title/premise) by George Beard and Harold Hutchins (The Creators of Captain Underpants) (aka Dav Pilkey) to your list of new books to pick up for your classroom library. It just came out August 10th and runs $9.99 in a sturdy hardcover and no annoying dust jacket for your students to take off and lose. My son (rising third grade) is so excited he can hardly stand for me to stop typing so he can get his hands on it. A great graphic novel to help some of the kids make it until Diary of a Wimpy Kid 4 comes out this fall! The boys are from Cleveland, Ohio and are part of a four book series. You can also hop on over to his website Dav Pilkey’s Extra Crunchy Website of Fun and learn how to draw the characters and other such fun! 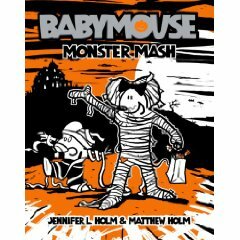 The newest Babymouse book is Monster Mash. Very cute and timely this month. Book nine is just as entertaining as the other Babymouse books. Graphic novels ARE reading and a great way to entice those reluctant intermediate readers. Ellie McDoodle New Kid in School by Ruth McNally Barshaw is a fun new cross breed of books that has been gaining popularity. I would describe it as a cross between a journal (think Amelia’s Notebook) graphic novel (Babymouse). Ellie has just had to move to a new town and is facing the tough “new kid to school” blues. Fortunately she has her journal, where she chronicles her downs (and some ups). The author does a great job of capturing common struggles for new students: people messing up your name, mean kids teasing, the job over meeting a new friend. I also like how the author captures some common issues of pre-teen students-relationships to teachers, trying to communicate/protest a school issue that seems unfair, and even touches on how to act with people with special needs. This the second Ellie McDoodle book. I bought the first one for my daughter (just started fourth grade) in my quest to find a new favorite book for her (her current is The Magic Half by Annie Barrows). I’ve always prided myself on being able to match books with students, turning reluctant readers into book lovers, and being able to help make connections for children between different books that the already read and ones that might be the “best book they haven’t read”. Unfortunately, but probably predictably, my daughter is my toughest sell. It drives her crazy when we go the library and parents and other kids will come up and ask me about books (it is a small town where almost everyone recognizes each other). I really like Interview with the Author at the end, told in the same style as the novel. A great addition for a classroom library!